H Singh Khalsa is a UK born guy who found his way into Sikhi over 8 years ago. Having fell head deep into Sikhi, he emerged as a Gurbani Reciter who has changed the worlds view on reciting Gurbani. His way of reciting Gurbani is more heartfelt, soulful and has a new melodical style. 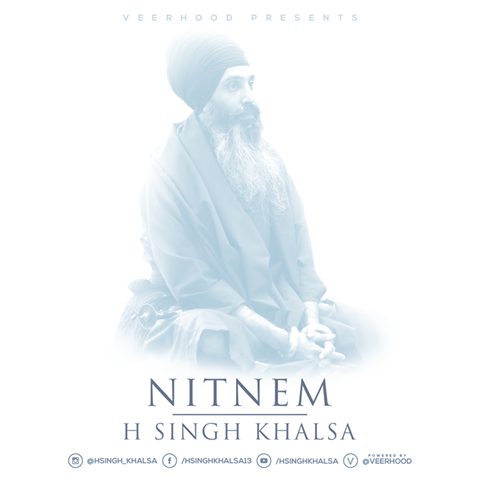 At the request of the sangat from around the world, he has recorded a humble attempt at Nitnem. “A Daily Journey, through Seven-steps of Love. A journey of Conversation, Relationship, Inspiration and Emotion. Like a Child talking lovingly with their parent, a Student talking with their teacher, a Disciple talking with their Guru, and a Soul talking with their God. A raw and unedited conversation, with the Shabads of Guru Ji. No studio effects for perfection, but an inspiration to sing Gurbani regardless of one’s voice. Regardless of mistakes, trying to connect and have a relationship with the Creator by walking daily on the minimum Seven-steps of love; commanded by Guru Ji. Khalsa Seva is a non profit charity that run a home for girls. They provide accomodation, medical and financial support, and a free education to those in hardship and need. Keeping Sikhi at the core of the charity, all children are encouraged to partake in daily Nitnem, Kirtan and Santhiya classes as well as doing Seva to promote Gurmat values within the Khalsa Seva family. They currently have over 50 girls from across India under the care of Khalsa Seva, and so to ensure that this seva can be continued, they require the sangats support and humbly ask for your dasvand. Please check out their social media pages for up date posts on the building work and all other projects we are involved in.